December 1879: Alexander Croall, distinguished curator of Stirling's recently-opened Smith Institute, has arranged a Christmas exhibition to raise funds for new acquisitions. The good and the great of Stirlingshire have been invited to view the richly-stocked galleries, from acclaimed nature artist Joseph Denovan Adam to the noted archaeologist and antiquary Christian MacLagan. Even the town's long-serving Provost, George Christie, will be in attendance. But the Smith Institute holds more than just the single largest exhibition space in central Scotland. Hidden amongst its treasures is an artefact of such significance that one guest will stop at nothing to get their hands on it. The evening's festive atmosphere is soon thrown into chaos as a daring crime is revealed... but is everything really as it seems at the Smith? Soon the eminent Mr Croall finds his skills of logical reasoning taxed to their limit as mystery piles upon mystery. Which of the visitors aren't who - or what - they appear to be? Is this audacious theft really the only enigma in evidence at the Smith on this fateful winter night? And exactly what is lurking in the darkest bowels of the boiler room? Aided by his resourceful daughter Annie and his feisty young helper Davie Buchan Morris, Alexander Croall must prove his hard-earned reputation for scientific deduction by tracking down the true culprit. But as the race against the clock intensifies, can even he succeed in unravelling the mystery behind the shadow in the gallery? This novel is a work of fiction. Although it refers to historical characters and places, the situations it presents are entirely fictitious in nature, and any resemblance to the actions of real people or actual events is entirely unintended. The Shadow in the Gallery is a story of a fictional crime and a very real museum - Stirling’s famous Smith Institute, now the Stirling Smith Art Gallery and Museum. 2014 marks the organisation’s 140th anniversary, and in celebration of this landmark date it has been my pleasure to be involved in the creation of an original novel, set during the early days of the building, which features its first curator: the eminent natural historian Alexander Croall. However, The Shadow in the Gallery is more than a commemoration of the Smith Institute’s history. It explores the Stirling of the Victorian era by highlighting some of the many extraordinary historical characters - artists and scientists, scholars and civic figures - who helped to make the town such a remarkable and vibrant place. Together, this diverse group of people find themselves unexpectedly hurled into the heart of a mysterious crime which takes place within the museum... but can Mr Croall and his guests identify the culprit before time runs out? All proceeds from the sale of The Shadow in the Gallery will be donated to the Stirling Smith Development Fund, in support of an ambitious ongoing project to extend the building, provide brand new services for visitors to the museum, and to help ensure that the Smith Institute will still be around for at least another 140 years to come! The Stirling Smith is a registered charitable organisation, and its continued operation depends on the support of the public in sustaining its work. I hope that you will join with me in championing this worthy cause. 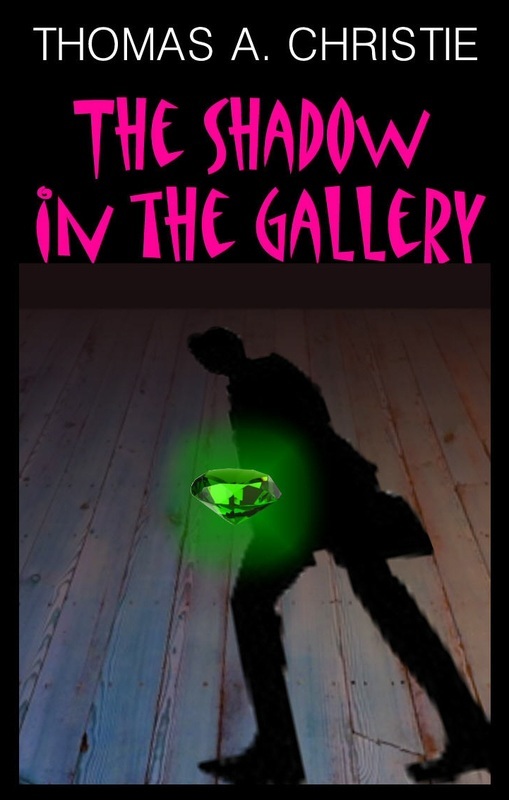 The Shadow in the Gallery features a cover design by legendary artist Bill Botten, creator of many famous book covers including those of the James Bond novels of Christopher Wood and John Gardner. Over the years Bill has designed covers for books by authors as diverse as Michael Crichton, Arthur C. Clarke, Margaret Drabble, Peter Haining, Christopher Isherwood, Arthur Miller, Michael Moorcock and William Styron, to name only a few. To browse a detailed gallery of his artwork, please visit his website at www.billbottenjackets.co.uk. The book also includes an afterword by Dr Elspeth King, Director of the Stirling Smith Art Gallery and Museum. As an author, it is an immensely humbling thing when someone parts with their hard-earned cash in order to read a book that you have written. It is an even more gratifying experience, then, when people are willing to pay even before the book has been published. 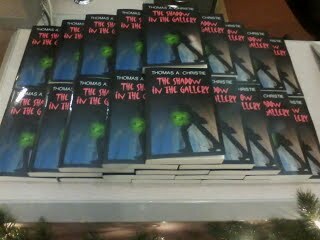 But thanks to the phenomenon of crowdfunding, that's exactly what happened with The Shadow in the Gallery, my first novel. Set in Stirling's Smith Institute during the late nineteenth century, the book was written with the full agreement of the Stirling Smith Art Gallery and Museum - the building's modern title. The story combines historical characters with a cast of fictional ones, and postulates a fictional theft from the museum which triggers an unexpected chain of events: a crime that makes for an eventful and mysterious Christmas at the gallery. As my earlier work on The Christmas Movie Book shows only too clearly, I just can't resist a festive story, and the thought of combining the holiday season with a Victorian mystery was too good an opportunity to pass up. I researched the background history of the novel for several years, with particular thanks to Dr Elspeth King and Michael McGinnes of the Smith who furnished me with many details of the real-life figures who appear in the book as well as the building itself. First opened in 1874, the Smith Institute has had a long and varied history which saw it occupied by the British Armed Forces during both World Wars. Today, as then, the organisation holds a treasure trove of the finest Scottish artefacts on display for the public to view, and it has remained dedicated to its founding mission of showcasing Scottish social and cultural history as well as artwork of all kinds. Enormous thanks are due to everyone who so kindly supported the Stirling Smith's campaign on Crowdfunder.co.uk throughout September 2013, an online donations drive which was conceived and operated by the Smith's administrator, Michelle Cook. Due to the overwhelming public support for the appeal, the Smith not only reached their required total but actually exceeded it by some margin. As all profits from the book's sale will go directly to the Stirling Smith Development Fund, every single donation has a genuine and much appreciated benefit for this registered charitable organisation. The Stirling Smith charges no admission fee for public access to their galleries and museum, so every copy of the book to be sold will help the organisation to welcome future generations in engaging with Scotland's art and cultural heritage. The Shadow in the Gallery was launched on Thursday 5th December 2013 at a special event which took place at the Stirling Smith. The launch featured an illustrated presentation, stage magic from psychological illusionist Derek Heron, and an appearance by cover designer Bill Botten.